Dutch reformed pastor and theologian, Jacobus Arminius (Latinized name of Jacob Harmensen or Hermanszoon), lost his family in the massacre of the inhabitants of Oudewater by the Spanish and was able to study thanks to the intervention of tutors and benefactors. He studied first in Leiden, then with Theodore Beza in Geneva. In 1586 he traveled to Italy and began attending the University of Padua; he was called back home for fear that he was falling under the influence of the Jesuits. Ordained a Pastor in Amsterdam (1588), in 1603 he was named a professor of theology in Leiden. Opposed to a strict interpretation of predestination, he entered into conflict with a colleague of his in Leiden, Franz Gomarius, exponent of the Calvinist Church. 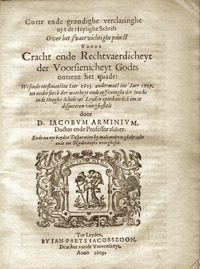 The Arminian doctrines were systematized by his successors, Simon Episcopius (Bischop) and Jan Uytenbogaert, and officially asserted in 1610 in the “Five Articles of the Remonstrants” (from which derives the name “The Remonstrants”. 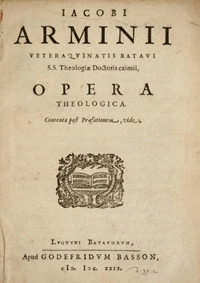 Arminianism was officially condemned by the Synod of Dordrecht in 1618-1619, but it continued to exert great influence on other pietistic and Methodist schools of thought. Main works: Disputationes (1610); Declaratio sententiae de praedestinatione (1610); De vero et genuino sensu cap. 7. Epistolae ad Romanos dissertatio (1612); Opera theologica (1635); Examen thesium D. Francisci Gomari de praedestinatione (1645). Bibliography: G.O. McCulloh, Man’s Faith and Freedom: The theological Influence of Jacobus Arminius, New York, Abingdon Press 1962; J.M. Hicks, The Theology of Grace in the Thought of Jacobus Arminius and Philip van Limborch: A Study in the Development of seventeenth-century Dutch Arminianism, dissertation, Philadelphia 1985; C. Bangs, Arminius: A Study in the Dutch Reformation, Grand Rapids (MI), Francis Asbury Press 1985; The works of James Arminius: the London edition, translated by J. Nichols and W. Nichols, introduction by C. Bangs, reprint, 3 vol., Grand Rapids (MI), Baker Book House 1986; P.O.G. White, Predestination, Policy and Polemic: Conflict and Consensus in the English Church from the Reformation to the Civil War, Cambridge, Cambridge University Press 1992; K.D. Stanglin, To comfort the afflicted and upset the secure: Jacobus Arminius and the Roots of the Leiden Debate over the Assurance of Salvation, dissertation, 2006; F.S. Clarke, The Ground of Election: Jacobus Arminius’ Doctrine of the Work and Person of Christ, Bletchley-Waynesboro (GA), Milton Keynes-Paternoster 2006; R.E. Olson, Arminian Theology: Myths and Realities, Downers Grove (IL), IVP Academic 2006; K.D. Stanglin, Arminius on the Assurance of Salvation: the Context, Roots, and Shape of the Leiden Debate, 1603 1609, Leiden, Brill 2007. Catalogus librorum ... D. D. Iacobi Arminii quondam in Academia Lugdunensi Theolog. professoris quorum auctio habebitur, etc. Ex officina Thomæ Basson: Lugduni Batavorum, 1610, 50 p., in 4°. 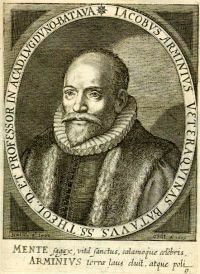 The catalogue of Arminius’ library is divided into 7 categories, which are then further divided by format: theological books, legal books, history books, medical and philosophical books, philological and literary books, miscellaneous books, books in other languages (Dutch, French, English, Italian, etc.). The volumes are not numbered, nor are there any editorial (place, date, printer) indications.